Take your pick -- Pedroia or Youk for MVP? By definition, of course, the award is exclusive. It's the Most Valuable Player. There can be no sharing of a superlative, no splitting of ballots, no compromising of loyalties. Conceivably, two men could win. But you can only vote for one. So who's it going to be in 2008? 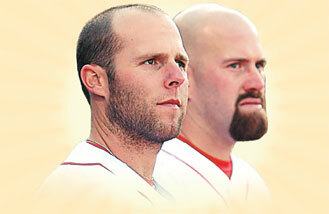 Kevin Youkilis or Dustin Pedroia? This year, beyond the city limits, the decision obviously grows in complexity. Come Tuesday at 2 p.m., when the American League MVP is announced, the list of those receiving votes will be considerable. The unofficial frontrunners are Twins first baseman Justin Morneau, Angels closer Francisco Rodriguez, and White Sox outfielder Carlos Quentin (who could receive ample support despite a season-ending injury suffered with roughly a month left in the season), and two Red Sox players: first baseman Youkilis and second baseman Pedroia. Each is as worthy of the honor as any other candidate, yet only one man could be placed atop each ballot when votes were cast immediately after the regular season, before the start of the playoffs. Two of the 28 AL ballots were cast from Boston -- each of the 14 AL cities gets two votes, distributed to members of the media who regularly cover the corresponding team -- and even then, choosing between Youkilis and Pedroia was impossibly difficult. After all, if Bostonians and New Englanders cannot agree on which player is the MVP of the 2008 Red Sox, how can they possibly agree on which is the MVP of the American League? "It's a great debate and it's part of what makes the baseball season so much fun," said Red Sox manager Terry Francona. "But I don't need to be in that debate. What I need to do is back both of them. I wish they could split it." For that to happen, Youkilis and Pedroia would need to end up with precisely the same number of points. The Baseball Writers Association of America has handed out the MVP Awards since its inception in 1911, and only once have there been co-winners. In 1979, Pirates first baseman Willie Stargell and Cardinals first baseman Keith Hernandez shared the honor. In that case, Hernandez ended up first on 10 of 24 ballots, and Stargell was named first on just four. He made up the difference by being named much higher by the remaining 14 voters. The case for Kevin Youkilis is both comprehensive and indisputable. During the 2008 regular season, Youkilis finished sixth in the AL in batting average (.312), sixth in on-base percentage (.390), third in slugging (.569), and fourth in OPS (.958). He ranked fourth in the league in RBIs (115) and fourth in extra-base hits (76), leading the Red Sox in both home runs (29) and RBIs. And yet, none of that even begins to measure Youkilis' true value to a club hindered by injuries from the very start of the season until the very end. Proof? One year after spending most of the 2007 season as Francona's No. 2 hitter, Youkilis batted everywhere from first to seventh this season, frequently filling whatever gap was necessary. Youkilis spent much of that time hitting anywhere from second to sixth, where his batting averages plotted the kind of line that the stock market strives for: .290, .364, .299, .326 and .322. Until this year, Youkilis was regarded very much as what baseball people might describe as a "first-half player" -- his performance dipped noticeably after the All-Star break. Much of that drop was attributed to Youkilis' previously unbridled intensity, which many blamed for his yearly flameout. But in 2008, after a career that suggested he could not handle the distance, Youkilis batted .310 after the All-Star break (compared to .314 before) while improving his on-base percentage, slugging percentage, and OPS, all after he took on a greater responsibility in the Boston lineup following the deal that sent future Hall of Famer Ramirez to the Dodgers. Along the way, while setting a major league record for consecutive games without an error at first base, Youkilis moved across the diamond and allowed the Sox to effectively absorb the loss of Mike Lowell, limited by (and then lost to) a hip injury. In an age in which many players are flustered by position changes, Youkilis actually hit better at third base (.328 BA, 1.010 OPS) than he did at first (.310, .949). He gave the team (and Francona) invaluable flexibility by continuing to produce no matter where he hit or played. Whatever holes the Red Sox had in 2008, they did not need to fill them. Youkilis did that for them. America loves the underdog, so we must absolutely adore the wonder puppy. But before anyone suggests that Dustin Pedroia is the little engine that could, a small man succeeding in an athletic world dominated by big men, stop. Pedroia deserves so much more. And he is so much better than that. "He's one of the best players in baseball," Francona said shortly after the season. And that is true whether Pedroia is 5-foot-9 or 6-foot-2. So now we finally know the truth: Size doesn't matter. In 2008, the 5-foot-9, 180-pound (wink, wink) Pedroia ranked first in the AL in doubles (54) and fourth in total bases (322) while finishing with a higher slugging percentage (.493) than, among others, Nick Markakis, Bobby Abreu, Torii Hunter, Adrian Beltre, Joe Mauer, Paul Konerko, Jose Guillen, and Garret Anderson. Along the way, Pedroia won his first Gold Glove Award and Silver Slugger Award while stealing 20 bases (in 21 attempts). That stat places him ahead of, among others, faster runners like Hunter, Alexei Ramirez, Derek Jeter, Curtis Granderson, Alex Rodriguez, and Orlando Cabrera. Quite possibly, as a result, one could make the argument that Pedroia was the MVP in baseball, not solely in the AL. For the Red Sox, particularly after the departure of Ramirez, Pedroia's true value was most evident in his versatility, primarily at the plate. Late in the season, when Youkilis was temporarily sidelined, Pedroia batted cleanup for five games and went an absurd 12-for-18 (a .667 average) with four doubles, two home runs, seven RBIs, and six runs scored; he slugged 1.222 and posted an OPS of 1.889, fueling his candidacy for the MVP award and leaving little doubt that he is a big-time player with a big credentials. In the second half of the season, Pedroia batted .345 with an OPS of .949. In August and September, when MVPs are typically won and lost, he batted a combined .353 with a .995 OPS. Pedroia scored 118 runs to Youkilis' 91, a margin of 27. Youkilis had 115 RBIs to Pedroia's 83, a difference of 32. Pedroia outhit Youkilis by .014 points, .326 to .312. Youkilis had an identical edge in on-base percentage, .390 to .376. The Red Sox would not trade one for the other, because they needed both. In all of baseball, there may not be better right side of the infield this side of Ryan Howard and Chase Utley, who anchor the lineup of the reigning world champion Philadelphia Phillies. "I think they're both dynamic young players," Francona said of Youkilis and Pedroia, who will finish next season at the respective ages of 30 and 26. "Youk took his game to another level and Pedey, because of the way he played, he just kind of took the league by storm." And so, until Tuesday, the final question remains unanswered: Can either take home the MVP? And if you had to pick just one, who would it be and why? Let us know in the comments section. 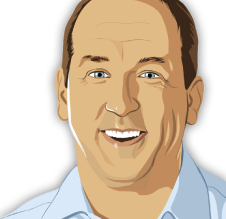 This column also appears in the latest edition of OT.